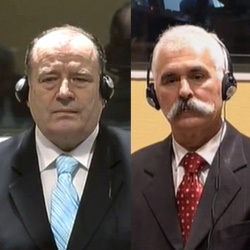 Mićo Stanišić and Stojan Župljanin, two high level officials in Bosnian Serb structures, were today each sentenced to 22 years imprisonment for crimes against humanity and war crimes committed between April and December 1992 in Bosnia and Herzegovina (BiH). Mićo Stanišić, Minister of the Interior of Republika Srpska, was convicted of crimes committed in 20 municipalities throughout BiH: persecution, a crime against humanity, through the underlying acts of killings; torture, cruel treatment, and inhumane acts; unlawful detention; establishment and perpetuation of inhumane living conditions; forcible transfer and deportation; plunder of property; wanton destruction of towns and villages, including destruction or wilful damage done to institutions dedicated to religion and other cultural buildings; and the imposition and maintenance of restrictive and discriminatory measures. He was also convicted of murder and torture as violations of the laws or customs of war. Stanišić was found not guilty of extermination as a crime against humanity. Stojan Župljanin, during the indictment period, was the Chief of the Regional Security Services Centre of Banja Luka, and from May to July 1992 also a member of the Crisis Staff of the Autonomous Region of Krajina (ARK). The Trial Chamber today convicted him of crimes committed in eight municipalities in BiH: persecution, a crime against humanity, through the underlying acts of killings; torture, cruel treatment, and inhumane acts; unlawful detention; establishment and perpetuation of inhumane living conditions; forcible transfer and deportation; plunder of property; wanton destruction of towns and villages, including destruction or wilful damage done to institutions dedicated to religion and other cultural buildings; and the imposition and maintenance of restrictive and discriminatory measures. He was also convicted of extermination as a crime against humanity and murder and torture as violations of the laws or customs of war. The Chamber was satisfied that a number of crimes had been committed in 20 municipalities in BiH, including Prijedor, Sanski Most, Banja Luka, Zvornik, Donji Vakuf, Bijeljina, Brčko, and Pale. Many of the findings relate to the crimes that took place in more than 50 different detention facilities, including Omarska, Keraterm, and Trnopolje camps, set up by Bosnian Serb forces where captives were beaten, tortured, mutilated, sexually assaulted, humiliated, and psychologically abused. Many detainees were killed or died as a consequence of the mistreatment. Across the municipalities, thousands of non-Serbs were either killed or forcibly displaced from their homes. The Trial Chamber was satisfied beyond reasonable doubt that both Stanišić and Župljanin participated in a joint criminal enterprise (JCE) with the objective to permanently remove non-Serbs from the territory of a planned Serbian state and that many of the crimes committed in the municipalities were foreseeable to the Accused. The JCE came into existence no later than the establishment of the Assembly of the Serb People in BiH on 24 October 1991 and remained in existence throughout the Indictment period. What followed after the commencement of the JCE “were the violent takeovers of those municipalities and the ensuing widespread and systematic campaign of terror and violence”. The Bosnian Serb leadership was in charge of the events taking place in the municipalities through its control over political and military structures. The goal “was the establishment of a Serb state, as ethnically ‘pure’ as possible, through the removal of the Bosnian Muslims and Bosnian Croats”. Mićo Stanišić and Stojan Župljanin were initially indicted by the Tribunal in 2005 and 1999, respectively. Mićo Stanišić surrendered and was transferred into the Tribunal’s custody on 11 March 2005. Stojan Župljanin was arrested by Serbian authorities and brought to the Tribunal’s Detention Unit on 21 June 2008. The Trial Chamber granted the Prosecution’s motion to join the two cases in September 2008. On 20 November 2008, both accused pleaded not guilty to all charges. The trial commenced on 14 September 2009 and concluded on 1 June 2012. The Trial Chamber sat for 354 days, during which it admitted the evidence of 199 witnesses and entered 4,377 exhibits into evidence. Since its establishment the Tribunal has indicted 161 persons for serious violations of humanitarian law committed on the territory of the former Yugoslavia between 1991 and 2001. Proceedings against 136 individuals have been concluded.